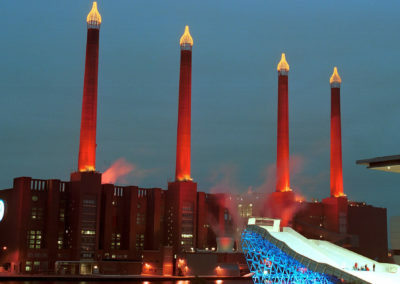 Every year, the city of Bremerhaven treats visitors to a waterside son et lumière in the harbour area – this year’s was the fortieth such show. 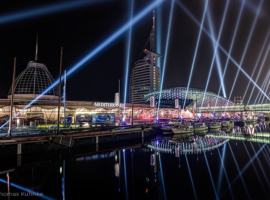 The 40th Bremerhaven Festival Week attracted thousands upon thousands of visitors to the city with a colourful spectacle to which stalls, a carnival, live music and a flotilla of over 180 ships all contributed. 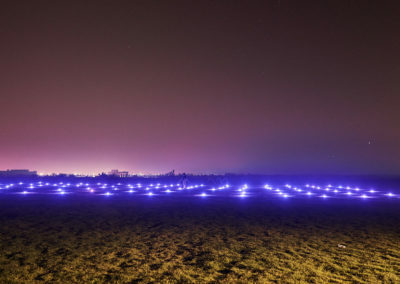 A light show should undeline the festivities. On calm summer evenings, the surface of the water is like a mirror in which the spectacular productions of the Bremerhaven Festival Week are reflected. Dazzling beams of light this year danced over the Old Harbour and the New Harbour alike, mesmerizing a vast multitude of visitors. 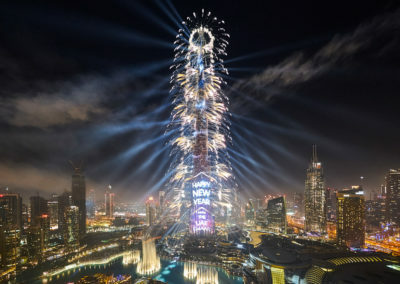 From 9 in the evening to 1 o’clock in the morning, beams of light visible for miles around from FALCON Skyscrapers painted images in the night sky that merged into each other. 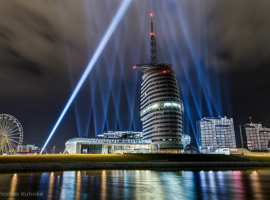 Commissioned by Erlebnis Bremerhaven GmbH, AO Creative created the nocturnal light show especially for Bremerhaven Festival Week. 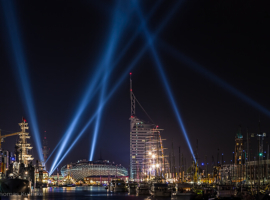 Six beams of light from FALCON BEAM 4000W searchlights positioned on six stages converged above the Atlantic Hotel SAIL City, forming above the sail-shaped building a static dome of light. Meanwhile, FALCON CMY LED-VIDEO LED/Xenon hybrid luminaires installed on the dockside between the Klimahaus, Mediterraneo and Columbus Center, delighted onlookers with their sophisticated, time-controlled, pre-programmed lighting choreography, as their video panels displayed subdued wavelike movements symbolizing water and fire. 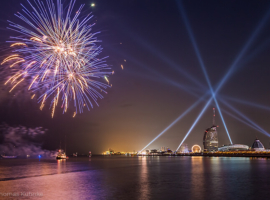 Bremerhaven Festival Week this year drew 180,000 visitors to the harbour. The festival was inaugurated in 1974. The opening of the National Maritime Museum has given fresh impetus to Bremerhaven’s awareness of its maritime tradition. 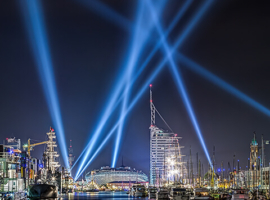 Bremerhaven Festival Week is one of the largest maritime festivals on the North Sea. The focus is upon the various epochs in the development of shipbuilding and navigation in the widest sense of the terms.